T/Sgt. Edward P. Kita, 32832980, Radio Operator; 1/Lt. 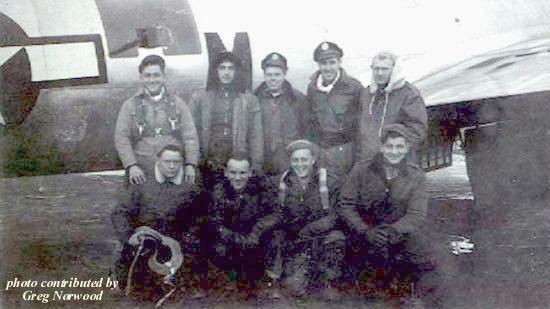 Lawrence H. Brummer, 0-2065504, Navigator; 2/Lt. Donald J. Shoemaker, 0-778592, Co-Pilot; Capt. Ervin E. Vassar, 0-770854, Pilot; M/Sgt. Charles W. Simons, 7022635, Bombardier. S/Sgt. Strozier Lang, 34089094, Waist Gunner; S/Sgt. George Koehler, 33799309, Ball Turret Gunner; T/Sgt. Ellsworth Norwood, 36754400, Engineer; S/Sgt. Andrew E. Faccio, 36829716, Tail Gunner. Chippewa Factoid - This aircraft was originally assigned to the 457th Bomb Group. On 4 November 1944 it was assigned to the 91st bomb Group, and Charlie Busa, noted 91st artist, painted the nose art for Chippewa. The feathers on the Indian head were quite patriotic; RED, then WHITE, then tipped in BLUE. Flying with the 324th, in the low squadron, Chippewa-The Milwaukee Road flew her first mission 9 November 1944, to Metz. The final mission of the 91st BG was also Chippewa's 25 April 1945 to attack an airfield on the southwest outskirts of Pilsen, Czechoslovakia. After completing some 50 plus missions, and bringing 22 different crew safely back to Bassingbourn, Chippewa was sent to the Zone of Interior (ZOI) on 26 May 1945. On 19 November 1945, she was sent to Kingman, Arizona.